During the 1990s, according to the National Housing Institute, less than two cents of every dollar spent by African Americans was going to black-owned businesses. 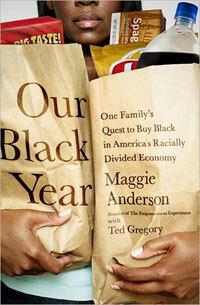 Troubled by this and other stats demonstrating stark economic disparities, Maggie Anderson’s family, a well-to-do bunch who attended the Obamas’ Chicago church, decided to patronize only black-owned businesses for a year. In the process, they had to put up with gangsta wannabes, racism allegations, and the difficulty—shared by many a low-income urbanite—of finding a decent grocery store. But they emerged with an appreciation for how African Americans’ collective $913 billion buying power, wielded with due care, might bring a little prosperity to the hood. Be sure and read our interview with the author here.